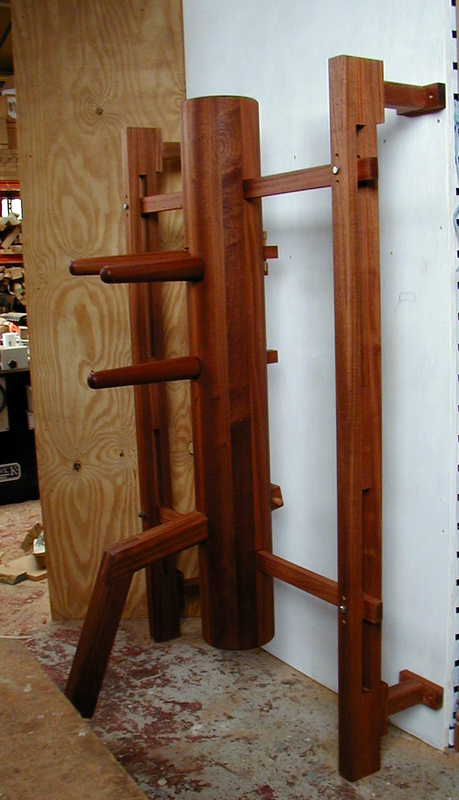 Wing Chun (Ving Tsun) kung Fu Wooden Dummy Parts. Dummy made in Sapele including frame for wall mounting. 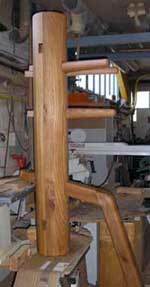 Click here to see the construction of an Elm wall mounted dummy. The arms will be sold as a set of three comprising of the top two arms which will have the square shafts offset in order for them to sit more level when inserted into the dummy body. The middle arm will have the square shaft cut on the centre so that it sits perfectly on the centreline of the dummy. They will be provided smooth sanded complete with locking pin and ready for staining, oiling and finishing. The only thing that you will need to do to the arms is to set them into your dummy body to locate where to drill the hole for the locking pin. These arms are sold as a set of three comprising of two top arms and one centre arm, complete with turned oak pins. These arms differ from the standard arms as the shafts are turned at 34mm round and have a 40mm square section which is 55mm deep, this allows the dummy body to be drilled with a 38mm hole then you only need to square cut the first 55mm of the hole at the front of the dummy. The shafts of the top arms are still offset so that they will sit more level and this makes the task of cutting the holes much easier and quicker. The only thing that you will need to do to the arms is to set them into your dummy body to locate where to drill the hole for the locking pin. These are available in a length of your choosing. They will need to be set into your dummy body and the mounting frame in order to drill the holes for the securing bolts. The type of finish that you apply to your dummy is up to you. The dummy components come smooth sanded and are the natural colour of the wood. The only finish that they will really need is a few coats of an easy to apply Danish or Tung oil. These are the best type of finishes to use as they nourish the wood, protect the surface of the wood and can be re-applied when your dummy is looking a bit tired.